This is yet another reason why I love being Catholic. I love Saints and the ability to ask for their prayers and intersessions. Bothe Popes were amazing Men that answered God's call to the Vocation of Priesthood and then later a call to the Papacy. Waking up today at the house of the Benedictine Monks knowing that we have two new Saints in the Church was amazing. To be surrounded by Holy Men in a Holy Place was inspiring. I will blog more about the weekend later in the week. 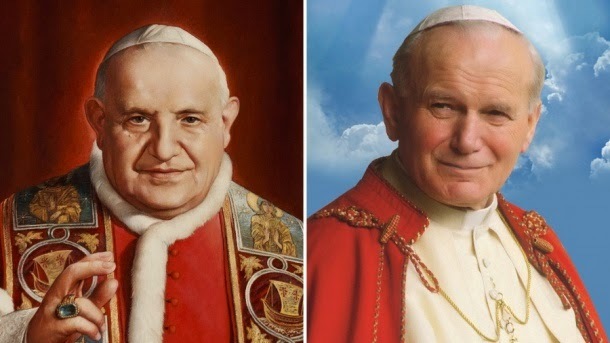 I was able to find a translation of the Prayers to both Saint John Paul II and Saint John XXIII. I will post them below along with the homily of Pope Francis today. I thought that Pope Francis's Homily was right on cue today. I hope you all were able to watch some if not all of the coverage and if you missed any check out EWTN and you will see it there. Until tomorrow, God Bless, and pray to our Two New Saints… May we have the courage they had in the world today to Shine the light of Truth and Stand for our Catholic Faith.